MVH Cameos of Caring Awardee, Gay Jannotta and Senior Vice President of Nursing, Mary Lou Murt. Each year, Monongahela Valley Hospital (MVH) honors its nurses in early May to coincide with both National Nurses Week and the birthday of Florence Nightingale - the founder of modern nursing. MVH hosted a nurse appreciation breakfast on May 11 to celebrate and thank its nurses. 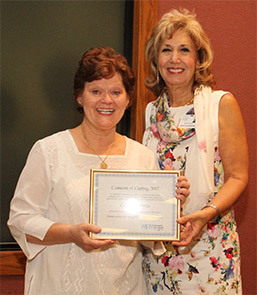 On her 36-year anniversary to-the-day at MVH, Gay Jannotta of the Coronary Care Unit (CCU), was named the recipient of the 2017 Cameos of Caring® Award by Senior Vice President of Nursing, Mary Lou Murt. Accepting the award to a standing ovation, Mrs. Jannotta with tears in her eyes, graciously thanked MVH saying, &quot;My co-workers and the hospital have been really good to me." She continued, &quot;We are just ordinary people, trying to do extraordinary things." &quot;In the years of providing nursing care at MVH, she has been committed to a lifestyle of caring," said Mrs. Murt. &quot;She has a deep commitment to the exceptional care and personal touch given to each patient." Mrs. Jannotta finds the most satisfying aspect of her nursing career is the teamwork that occurs when providing care to critically ill patients. Among her many strengths is the ability to help patients and their families who are confused, anxious and frightened to navigate the unfamiliar health care system. She applies her knowledge, demonstrates empathy and shares her contagious laugh. Sponsored by the University of Pittsburgh School of Nursing, the prestigious Cameos of Caring Award recognizes nurses who demonstrate excellence in nursing care, serve as advocates for patients and families and embody the essence of the nursing profession. Gay Jannotta will represent Monongahela Valley Hospital at the 19th Annual Cameos of Caring Awards Gala on Saturday, November 4, at the David L. Lawrence Convention Center. 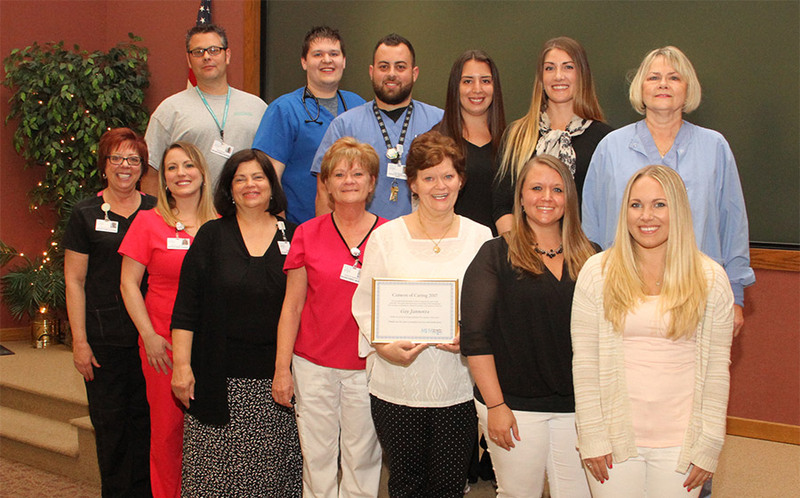 The 2017 MVH Cameos of Caring Nominees: (front row, left to right) Georgette Fergusson, RN, Amanda Turnbull, RN, Bonnie Luft, RN, Wanittia Anderson, RN, 2017 Cameos of Caring Awardee, Gay Jannotta, RN, Holly Giordano, RN, Rebekah Lonce, RN. (back row, left to right) Robert Reiland, RN, Aaron Sutch, RN, Ryan Wilson, RN, Ashley Monack, RN, Eryn Thomas, RN, Susan Gavaghan, RN.